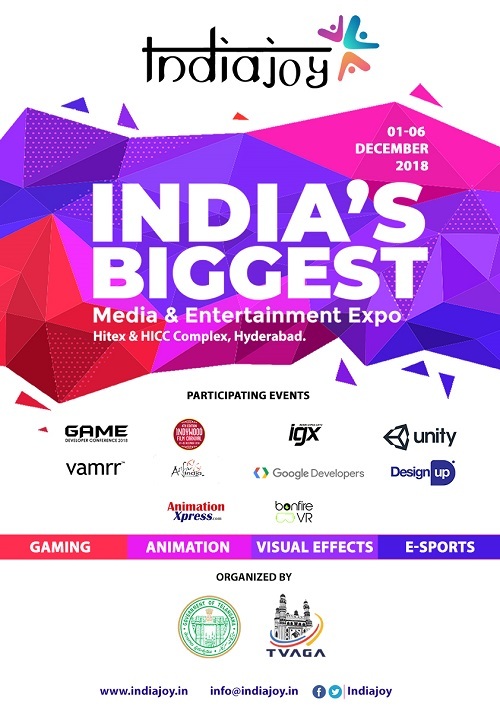 Government of Telangana in association with Telangana VFX Animation and Gaming Association TVAGA is conducting India Joy – largest Expo to celebrate gaming and digital media and entertainment content from 1 to 6 December 2018 in Hyderabad. India Joy is an aggregator platform, bringing together international events in one place to unfold opportunities for investors, corporations, studios, content developers, delegates, consumers, hardware manufacturers and students, through series of networking, trade exhibitions, product launches, B2B and B2C events. Some of the prominent events slated under the ages of India Joy includes India Game Developers Conference, Unite India (Unity), Indywood (Film and VFX),International Animation Day, AnimationXpress Investor Connect, eSports (Blitz),Google Developers Day, India Game Expo – IGX, India Design Summit and many more. With 15+ events, 5000+ international visitors, 25,000 participants’ footfall, during the week-long celebration, the Expo will be held in HITEX Exhibition Center and HICC in Hyderabad. India Joy’s aim is to promote Indian content through international relations and provide leadership and growth of digital media and entertainment industry in the country. India Joy – the Government-owned flagship event will bring significant value to digital media and entertainment community largely comprising of animation, gaming, VFX, AR VR content developers and investors. India Game Developer Conference – IGDC: India’s premier Game Developers’ Conference IGDC imparts insights, skills, keeping in mind global trends making it the most significant event of its kind in South Asia. Unite India: Unity Inc brings together creative, interactive learning and a chance to connect with experts and get a glimpse of the future. AnimationXpress Investor Connect brings together animation, VFX and gaming stakeholders on one platform with conferences and screenings. ASIFA CG Meetups celebrates the art of animation and gives artists the opportunity to network globally. VAMRR builds the ecosystem of virtual augmented mixed reality and digital transformation in India. It is committed to excellence and boundless enthusiasm in this field. Indian Games Expo-IGX combines the fastest growing online gaming entertainment industry which is one of the world’s most rapidly expanding consumer markets. Indywood is the confluence of world cinema and brings together passion and aspiration enabling enthusiasts to meet connect and showcase. Playmax Esports Carnival is the biggest gaming carnival in India with games like PUBG, WWE, FIFA, LoL, DoTA, Counter Strike. HITEX Exhibition Center and Hyderabad International Convention Center (HICC) will be the venue for all the above events which are known for their international standard facilities and their vast infrastructure spacing of eight halls adding up to a mighty 301,280 sq.ft and an open display area of 353,197 sq.ft. The organizers are indeed leaving no stone unturned to make this event a grand success for everyone who participates. The Government of Telangana being a prime promoter of this Umbrella Expo –India Joy, is facilitated by TVAGA which is a non-profit association of digital media and entertainment industry in Telangana. TVAGA has been working in collaboration with Government of Telangana, with the noble objective of promoting and supporting animation, gaming and visual effects industry. This collaboration is striving to bring the industry into the limelight, which is very much required today if we want media and entertainment to thrive in India. Any entity related to VFX, animation and gaming industry who would like to associate themselves with India Joy can register online. The interesting deal at the registration desk is the ‘All Access Pass’ that grants access to all the events for both visitors and those participating on all six days.